When Rice Fuller began working in counselling at the University of New Brunswick ten years ago, the waiting room was quiet. But as social stigma around mental health has decreased, the office has become flooded with student appointments. 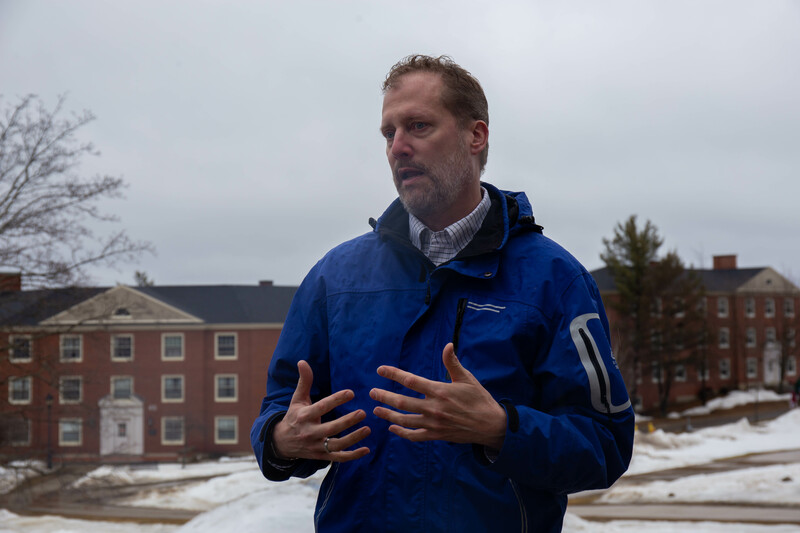 “I think that the situation that students are facing now is more stressful than what I faced or what, you know, previous generations have faced,” Fuller said, referencing social media and job prospects. The number of students seeking mental health help has risen drastically in Canada and worldwide for years, and that shift is straining campus resources. The number of individual students attending counselling per year at UNB Fredericton has grown by 40 per cent over the past decade, without any budget increase to Counselling Services since 2008. The severity of cases, including the percentage of suicidal students, has also skyrocketed. Counsellors say low salaries and increased job responsibilities, paired with surging student demand, are creating “burnout” among staff and has led to multiple resignations. The university employs seven counsellors, including the director, and a mental health strategist. According to Fuller, two licensed psychologists have resigned over the past year. 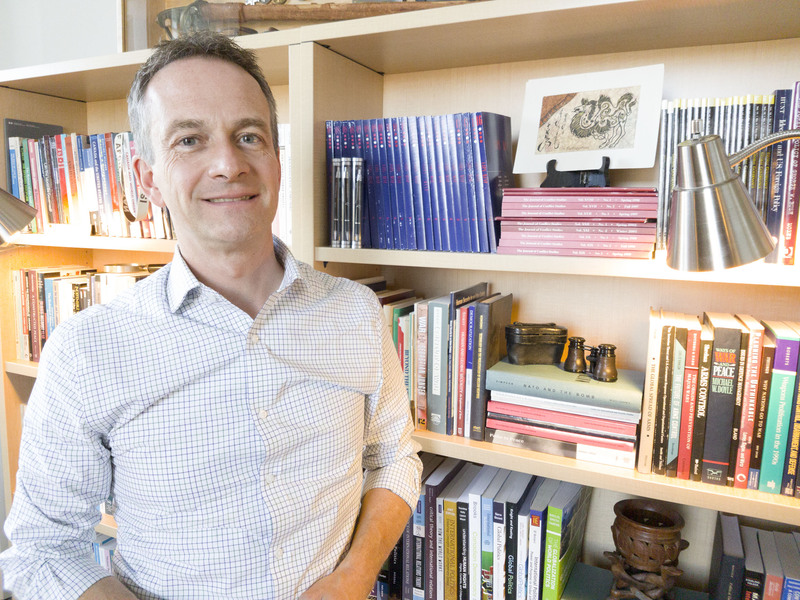 Fuller, the director of Counselling Services, is currently on leave due to the lack of support his department has received from the university. He said it became frustrating to watch counsellors work to cope with an unprecedented amount of appointments, without increases in funding or staff. 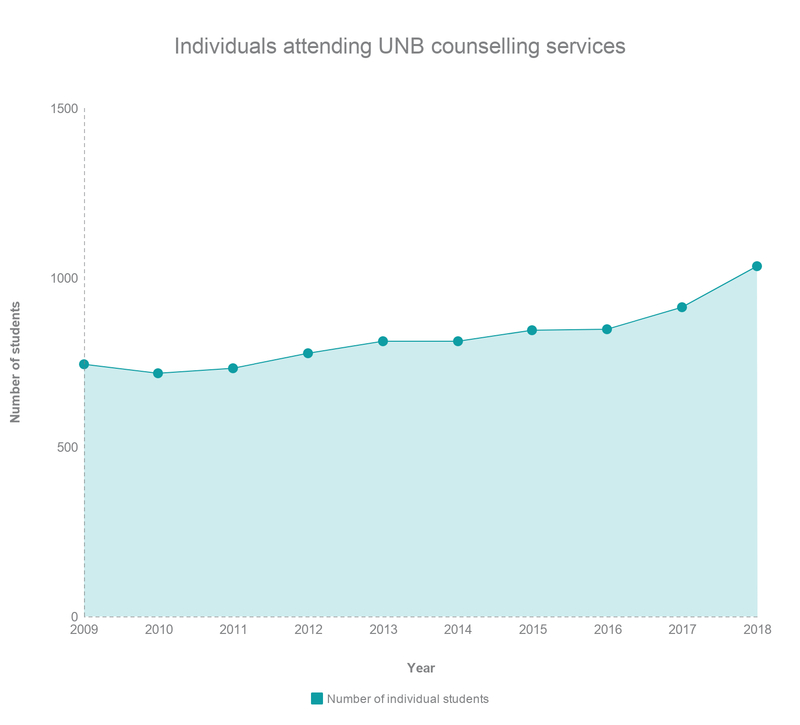 The number of individual students attending UNB counselling has risen from 744 in 2009 to 1031 in 2018. The average counsellor caseload per academic year has increased by 20 per cent over the last five years. Demand for student mental health services is similarly growing across the country. 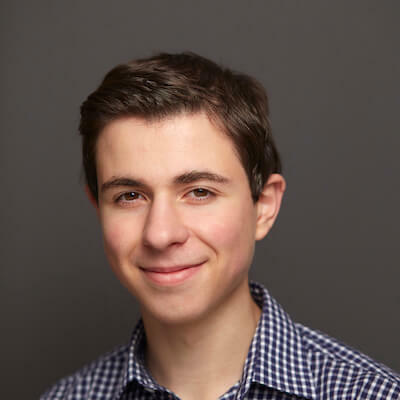 The number of appointments at the University of Toronto rose by about 40 per cent between 2012-2017, a period in which its student population went up 8 per cent, according to a February report in the Globe and Mail. Data released by Dalhousie University in 2015 showed a 68 per cent increase over five years, while Queen’s University has seen a 73 per cent increase over the past five years. Despite an increased number of students booking appointments, enrolment at UNB has declined by nearly 8 per cent over the past ten years. There are currently 8,319 full-time graduate and undergraduate students at both campuses, according to a survey by the Association of Atlantic Universities. Experts say the increased demand for mental health support can be attributed to many factors, including frequent technology use and more pressure to succeed. Fuller also points to greater awareness about mental health. “It’s just more socially acceptable to talk about mental health issues. We’ve done a lot to decrease stigma,” he said. Students say reduced stigma has allowed them to seek help and book an appointment. Makenzie Hinchey, a first-year arts and science student, said he was a bit nervous seeking counselling for the first time and had two friends accompany him to the waiting room. “I surprisingly didn't experience much stigma around going to counseling, mostly just support by friends who were proud of me for going despite a perceived stigma,” Hinchey said. Kate Metcalfe, a first-year Renaissance College student, said she initially didn’t go to counselling because she was nervous about running into peers. But she decided getting help was more important than her friends’ opinions. Metcalfe said she has since tried to share how beneficial UNB Counselling Services has been for her and encourages students who need help to book appointments. “I don’t think anyone should feel ashamed for getting help, if anything they should be celebrated,” she said. The severity of cases has also seen a significant increase. 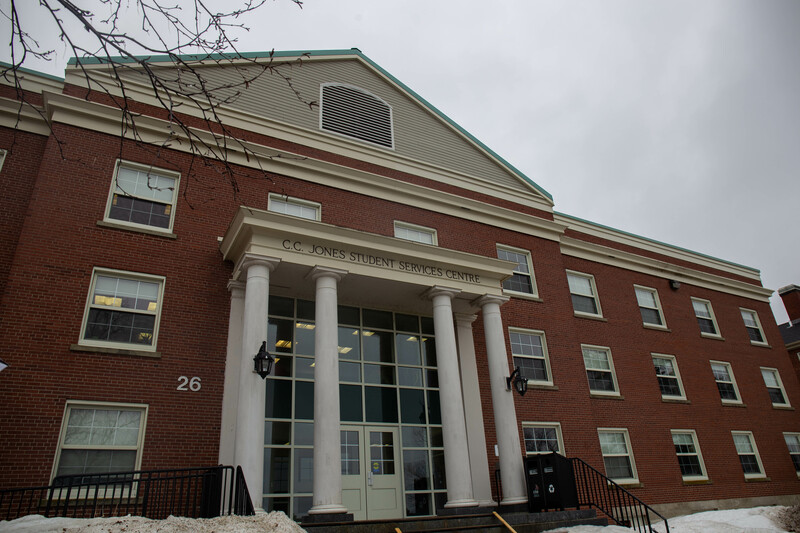 More than half of the students who go to UNB counselling report having suicidal thoughts. Statistics show more students are coming to counselling who have engaged in self-harm, attempted suicide, experienced unwanted sexual contact or have considered injuring another person. The number of students making appointments who have attended counselling previously has also gone up by 10 per cent. 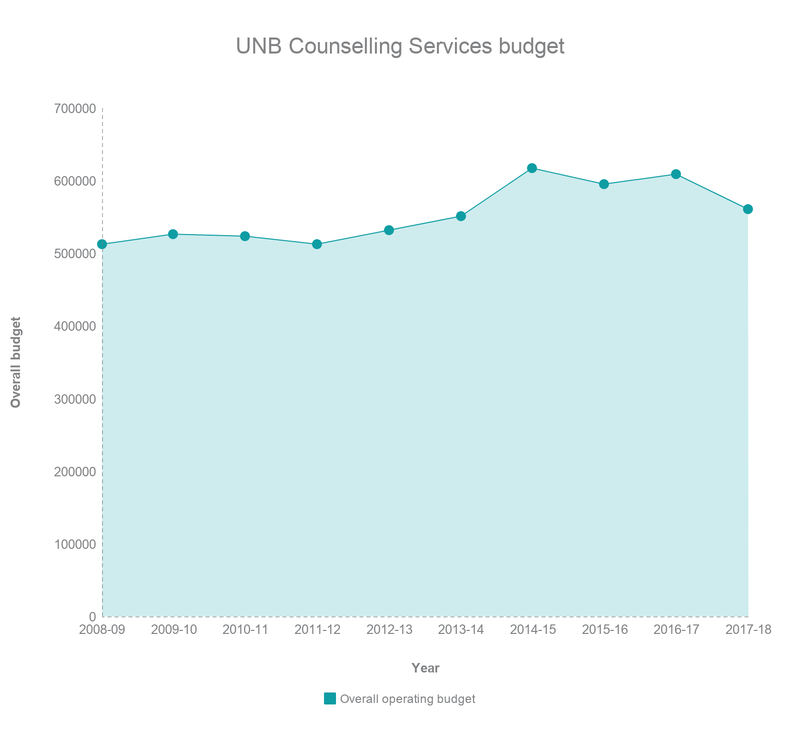 The operating budget for UNB Counselling Services has seen nearly no changes over the past decade and the office has seen no increase in professional staffing. Figures provided by university administration state the overall operating budget for Counselling Services for the 2017-2018 academic year as $560,744 with $32,254 in non-salary spending. The non-salary budget has only increased by $3,564 over the past ten years, while the overall budget has risen by $48,537 (This number includes contract-mandated salary increases). Dismayed by the growing challenges for counsellors, Fuller decided to draft a report compiling statistics on the department and outlining the increased workload. He submitted the report to George MacLean, vice-president academic, in early February. Fuller said he has not received a response. A UNB spokesperson said MacLean was unavailable for an interview, and provided a statement. MacLean said in the statement he is currently reviewing the report, and discussions are taking place on the issues that have been raised. “I will say that providing a safe campus environment through which our students can live, learn and engage is a top priority for me and I will continue to work with our Student Services team to see how we can better-support the work they do for our students,” MacLean said. Fuller said he has not met with MacLean or Mark Walma, assistant vice-president student services, regarding the report. MacLean said administration is in the process of assembling a bi-campus working group, comprised of members of UNB management and mental health professionals, to address the challenges the university is facing in providing mental health support to students. In January 2017, these challenges led to a month-long waiting list for students to receive initial counselling support. The office reduced time between appointments to just five minutes in response, giving counsellors less time to take notes and get ready for their next student. But the staff is now able to take in students for a same or next day initial appointment. The counselling office, located inside the C.C. Jones Student Services Centre, no longer has a break room for staff. That space has been turned into a meeting room. “My motto is that some care is better, some treatment is better than no treatment,” Fuller said. Rice Fuller, the director of Counselling Services, is currently on leave due to the lack of support his department has received from the university. Editor's Note: This is the first of a three-part series on the challenges UNB Counselling Services is facing in adapting to increased demand.